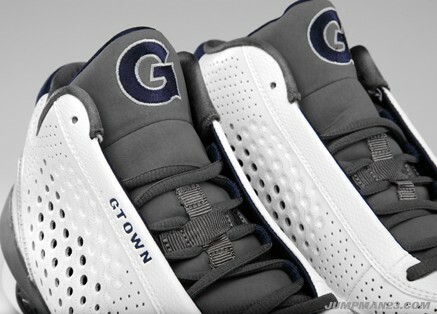 Georgetown is the latest Jordan-sponsored school to receive Air Jordan 2010 team exclusives. On Tuesday night, John Thompson's Georgetown Hoyas outlasted the 8th ranked Missouri Tigers in an overtime thriller. Led by senior guard Austin Freeman, the Hoyas now stand at 7-0 heading into Saturday's game against Utah State. 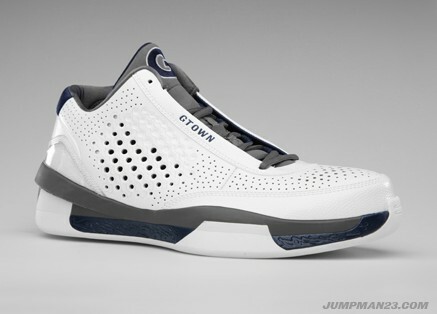 Georgetown is also another one of the Jordan Brand schools, and like North Carolina, California and Marquette, the men's basketball team has been supplied with an exclusive colorway of the Air Jordan 2010 Team. Perforated white leather dominates the upper of the Georgetown exclusive, with dark grey filling in the inner liner, tongue and upper portion of the midsole. Midnight navy chimes in on the lower half, as well as the heel tap and Georgetown marking on the tongue and along the eyestay.